The upper Midwest is usually considered the domain of Norwegian, German, and Swedish immigrants, but it turns out the Irish had far more impact on the settling of Dakota Territory during the late 19th century than I had ever realized. 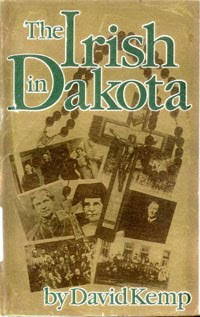 The Irish in Dakota, by David Kemp, is a fact-laden chronology of the movement of Irish families into Dakota, but doesn't extend much beyond that. The book is short, and only rarely diverges into analysis or storytelling, but I can see why genealogy websites list it under Irish ancestry resources. The book moves quickly through the late 19th century, a cascade of names and dates and places, providing its own context while lacking much breadth. I'd also say that the book focuses more on the parts we now call South Dakota than the entirety of the territory. Since the author relied heavily on South Dakota's historical societies, it is to be expected. I checked out the book from the public library because of my recent fascination with the Fenians, and the book devotes a large part to the Fenian presence in this area, which was more than I had even thought before. That's the book's strongest feature: it contains a lot of information that I hadn't read or heard before, so it did open my eyes to a facet of my region's history. The amount of information makes me feel there's a much larger book in there that hasn't been written, making this book short of what it could have become. 144 pages, 5½" x 8½"